Image via WikipediaCelebrated Earth Day this morning by getting a little of the planet on my feet and legs. Saturday morning means either soccer or African drumming -- or, in the case of today, both. From the rhythm of feet to the rhythm of hands. On this Earth Day, I'm thinking of things large and small. Large: Global warming (aka climate change) is becoming a more and more dominant issue, as erratic and severe weather dominate the news and evidence of climatic change mounts. Polar ice sheets are melting, ocean currents are changing, and much of the world (minus a few head-in-sand deniers) is talking about impacts and solutions. I won't pretend to be an expert; read up on it yourself. And to see the potential impact of rises in sea level in your neck of the woods, check out this Google Maps hack. 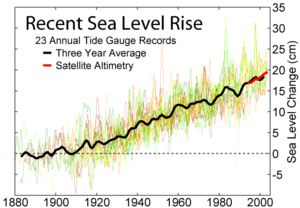 Different sources have different scenarios, but even a US government site (pubs.usgs.gov/fs/fs2-00/) points out that a historically consistent 10-meter rise in sea level "would flood approximately 25 percent of the Nation's population." Now, the fun part, a couple of Earth-centered songs from different traditions. Paul Wagner (aka Chiokten) is a Native American singer/storyteller who plays flute and mbira. I first caught him at the World Sacred Music Festival in 2005, and he's appearing again at the 2006 festival. You may know Ghana native Nii Tagoe from his work with Baka Beyond: composing, singing, playing percussion. African Roots is his first solo album. [mp3] Paul Wagner: "Mother Earth Remembers Us"
[mp3] Nii Tagoe: "Shipon (Earth)"
Finally, for more global music fun, check out La Onda Tropical.